Mish's Global Economic Trend Analysis: German Central Bank 228 Billion Euros in Debt Rescuing Europe; Bundesbank President Criticizes Merkel's Fiscal Pact, Says "No Grounds for Eurobonds"
German Central Bank 228 Billion Euros in Debt Rescuing Europe; Bundesbank President Criticizes Merkel's Fiscal Pact, Says "No Grounds for Eurobonds"
Both Angela Merkel and the Bundesbank are walking an extremely fine line of economic policies and treaty arrangements that appear to be in violation of policy statements made by the German Supreme Court regarding transfer unions. Moreover, the Bundesbank president is now in what amounts to an open Feud with Merkel. 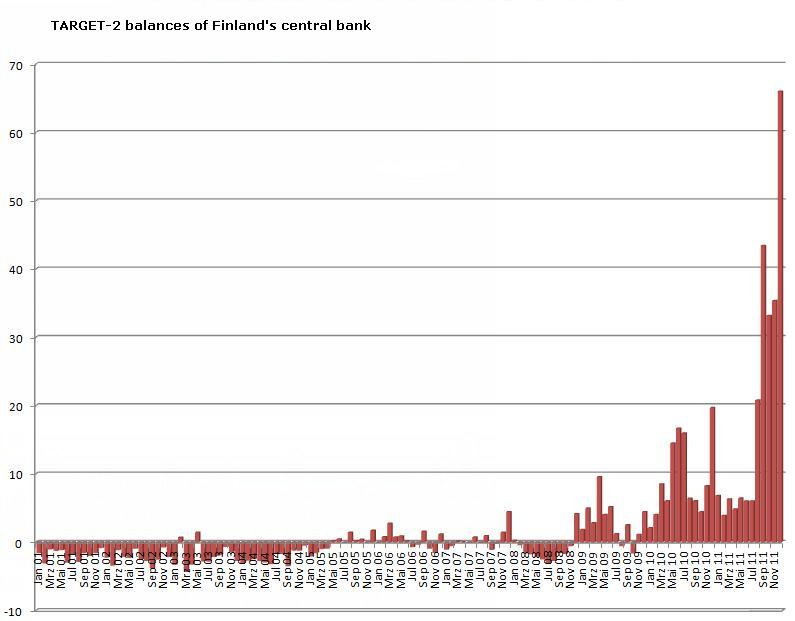 The operations are part of the European Central Bank's 'TARGET2' network of automatic payments between the national central banks of the Euroland club. 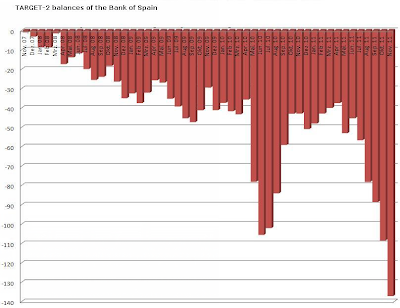 The Bundesbank has already provided €496bn (£413bn) to countries in trouble, chiefly Greece, Ireland, Italy and Spain. The Bundesbank - the dominant body in the euro system - used to keep a stock of €270bn of private securities (refinance credit) before the start of the financial crisis. This was depleted last year as it sold assets to meet growing demands on the TARGET2 scheme. Once the debt drama began to engulf the bigger economies, the Bundesbank was forced to borrow money to meet its obligations to offset capital flight, since it refused to sell its stash of gold. It now owes €228bn to German banks. "There are political limits to TARGET2 support. The reason why the ECB started printing money in December was to avoid pushing the Bundesbank deeper into debt," said Prof Westermann, referring to the ECB's provision of €489bn in cheap loans to banks for three years. 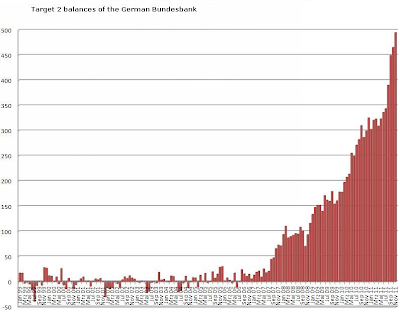 David Marsh, author of books on both the Bundesbank and the euro, said the TARGET2 system has the effect of locking Germany ever deeper into monetary union. "The longer it goes on, the larger the cost of a eurozone break-up since these credits could be wiped out with horrendous losses. It is about time this was the focus of proper debate in the Bundestag, since the German taxpayers may have to pay for it," he said. Given that German taxpayers are indeed on the hook should something go wrong, I am surprised no one has issued a direct challenge to the German supreme court to stop the madness. The ECB may indeed have taken over "printing money" but German taxpayers are still liable for their large percentage share of any problems at the ECB. In Summit Time – Batten Down the Hatches Pater Tenebrarum posted a nice series of charts on Target 2 balances. Germany's Top Judge Throws Major Monkey Wrench Into Leveraged EFSF Machinery, Demands New Constitution and Popular Referendum for Further Powers. Clearly the Bundesbank is walking a very fine line, with huge problems of its own. It does not need additional problems caused by politicians. Thus its patience with Angela Merkel for stepping over the line has run out. Bundesbank president Jens Weidmann last night criticized the fiscal pact Angela Merkel had forced upon her EU partners at last Monday’s summit, Financial Times Deutschland reports. "The guidelines for the national fiscal rules leave considerable room of manouver and there is no control on a European level to check if they are really respected", Weidmann said in a speech. Merkel’s former economic advisor also said he thought it was unlikely that the tougher rules of the new stability and growth pact would really be reinforced. "All that gives reason for some doubt", he concluded his assessment of the pact of which Merkel had said in her post summit press conference that its rapid adoption was "a masterpiece". The Bundesbank president went on to stress that the pact and the debates about control of national fiscal policies in the crisis countries showed that governments were not prepared to relinquish sovereignty to the European level. Therefor there were no grounds for a greater mutualization of debt or the introduction of eurobonds, Weidmann said. Merkel is under attack by members of her own political part and the president of the Bundesbank as well. As I said in Political Zugzwang, Merkel has no good options. Zugzwang is a term in chess. A player has to make a move but every move weakens the position. Pass is not an option. Merkel is in such a no-win position. Everything she does will put her under attack by someone. Doing nothing, is an option in politics but not chess. However, doing nothing also exposes Merkel to attack. Former European Commission chief Jacques Delors on Sunday blasted the reluctance of eurozone countries like Germany to boost the size of the Greek bailout and create a system of eurobonds to facilitate lending. "It is scandalous. You cannot be a member of the euro cooperation and at the same time say no to elementary demands for solidarity with other members within the framework of existing agreements," the prominent European federalist said in an interview with Dagens Nyheter, Sweden's daily of reference. "It is a mistake of German Chancellor Angela Merkel to refuse to go along with such bonds," Delors said. What's scandalous if for political hacks like Delors to assume the Eurozone is worth saving, then tell everyone else how to go about it without taking into consideration any restraints others may have. I suggest the euro is not worth saving. For the sake of argument, however, let's assume the eurozone is worth saving, and start with a look at Merkel's options. If Merkel proposed Eurobonds, her coalition would collapse and she would be ousted. Moreover, the German supreme court would certainly demand a referendum which would fail. The irony then, is if Merkel did what Delores asked, the eurozone would fly apart right here right now. If Merkel proposed significantly more bailout money, her coalition would also collapse and once again the proposal would be at risk of a challenge from the German supreme court. If Merkel does nothing, she takes heat from political dimwits like Delors and an entire gamut of other nanny-zone supporters. She also takes heat from her coalition. If Merkel steps up the pressure on Greece she hears it from her political opposition, from Delors, and from a whole host of parties representing a myriad of political views. That my friends is political zugzwang and that is precisely why she called for Greece to Cede Sovereignty to Eurozone "Budget Commissioner". Her proposal elevated the ire of Greeks as well as the likes of political hacks like Delors. However, blaming Merkel as Delors did is the height of arrogance. Not only is she at risk from from the German central bank, she absolutely cannot step over a line set by the supreme court. Thus, the option Merkel selected is the one that makes the most sense. It was her least-worst option. 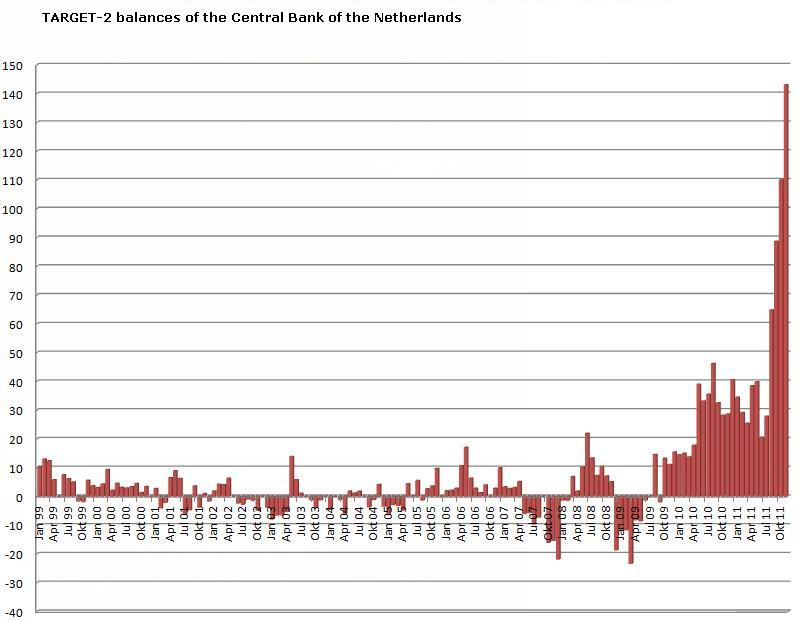 It also bought her and the eurozone the most time. It is the only option that has any chance of working. I think the best thing for the Eurozone would be for Germany to exit. The irony is that would likely happen quickly if Merkel embarked down the path demanded by Jacques Delors.